2) Meanwhile, in Nebraska, an IPCPR-supported bill was signed into law by Gov. 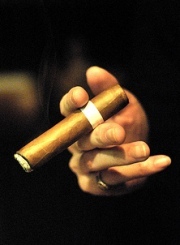 Dave Heineman on Wednesday that excuses cigar bars from the state’s smoking ban. In order to qualify for the exemption, 10% or more of an establishment’s revenue must come from the sale of cigars or other tobacco-related items. 3) Inside the Industry: Don Pepin Garcia is expanding his My Father line with two new sizes—a Cervantes (6.5 x 44) and an Eminentes (5.6 x 46)—both of which retail for around $9 per cigar. Newman’s Nicaraguan puro line, El Baton, is also adding two new sizes, a Robusto and a Double Torpedo. In anticipation of the SCHIP tax that hit on April 1, cigar makers imported almost 50% more cigars in March 2009 than they did in March 2008, the last month before the tax hike went into effect. 4) Around the Blogs: Stogie Review reviews the Cabaiguan Guapos Maduro. Keepers of the Flame lights up a Siglo Limited Reserve. Cigar Inspector inspects the Sancho Panza Molinos. Cigar Spy tries the Cruzado. Matt smokes a La Gloria Serie R Maduro. 5) Deal of the Week: This “Mega Sampler III ” features 16 fine cigars for the bargain price of $30. You get to try smokes by Gurkha, Rocky Patel, La Flor Dominicana, La Gloria Cubana, Camacho, Cusano, Cuesta-Rey, Alec Bradley, Hoyo de Monterrey, and CAO, all for under $2 per stick. Pick yours up here .